In emailing recently with the brilliant tech geek Eli Schwartz of SurveyMonkey, I discovered – again – that the man is one of the IM world’s more advanced practitioners. I said I discovered this again because in the past, Eli was one of the first people who realized how to arbitrage ads and implemented the strategy at scale. You can try to pry the details out of him by reaching out privately over Twitter if you like. Now, as a treat to our audience, Eli’s agreed to share some of what goes on behind the dark, secretive curtains of Castle Dracula (“in the sunny offices of SurveyMonkey” just doesn’t have the same ring to it 🙁 .) Specifically, we’re gonna talk about links, and 404 pages. “Our blog used to be hosted as a subdomain, but we recently moved it over to our root domain. Now the blog has the same authority as the rest of our site (PR 9 etc), but I have full access to the blog to hide links where ever I need to test :). 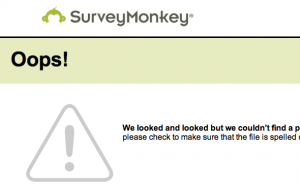 SurveyMonkey used 404 pages for testing Google’s functioning. “I modified our 404 page, and added a link to a page with bogus text just for the test. I then forced Google to hit a 404 pretty quick by inserting a broken link into a just published piece. Results: Google crawled the 404 page quickly, and followed the link on the 404 – and indexed the test page within 48 hours. The anchor text was picked up too, and the page ranked for a term I invented that had no other results for that word. Then I modified the test by adding a nofollow into that link. Google again indexed the URL within 48 hours, but did not pick up my anchor text. Key takeaways are: Google does index 404’s, Google does crawl nofollows, Google even indexes nofollows, Jury is out on anchor text since I only tried it once, but I am about to run this one again. Extra postscript from Eli: In addition to just checking to see if pages we indexed, I also watched our logs to see when Google would crawl the nofollow. In each case, Google crawled the nofollow on the first time it discovered the nofollowed link on the page. Note from your truly: For noncommercial terms, I’ve seen nofollow links help to rank pages.